While insurgent country hasn't exactly swept the nation, it has carved out a respectable niche for itself. The epicenter for this movement, of course, is Chicago's Bloodshot Records, and though the style does pre-date the label, it can lay claim to giving the genre its voice. After all, the company has collected insurgent country's finest talent — including Alejandro Escovedo, Robbie Fulks, Neko Case, and Kelly Hogan — in one place, offering these artists a greater chance to be heard. The heart and soul of Bloodshot, however, is unquestionably the Waco Brothers, a group that unfortunately has struggled in the studio to capture the magic of its concerts. On its last album Waco World, the band finally found its voice, and the resulting music managed to transcend the alcohol-soaked haze of its lyrics. With the release of its fifth effort Electric Waco Chair, the ensemble, which features members of the Mekons, KMFDM, Jesus Jones, and Wreck, offers another fine set of anthems for the working class. The Waco Brothers' songs are those of despair. They are tunes for the broken-hearted. The down-trodden. The souls so badly beaten by life that heavy drinking only dulls the pain, and death is the only true release. Yet, the Waco Brothers has a way of making the torment just a bit more tolerable. After all, life can't possibly be as bad for you as it is for the characters in the group's songs, right? 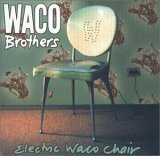 Granted, Electric Waco Chair doesn't really add any new dimensions to the Waco Brothers' music. Like its predecessor, however, it does manage to tread with pristine accuracy the fine line that separates The Clash from the Rolling Stones. It's Not Enough resurrects the former covering I Fought the Law; Jamaican Radio Obituary digs into the latter's country rock catalog; and Cornered comes off as an outtake from Goat's Head Soup. There's no question that no one blends these two elements better than the Waco Brothers, and by augmenting its roadhouse reflections with a splash of fiddle and pedal steel, the group effectively has staked out its own turf as well. Unfortunately, insurgent country remains just a niche market, and as such it's difficult to achieve the level of exposure that bands like the Waco Brothers deserve. Everything has to start somewhere, however, and while none of these artists has yet to pierce the ceiling and make a break towards mass appeal, that doesn't mean one can't enjoy watching them try — provided one knows where to look. Electric Waco Chair is available from Barnes & Noble.